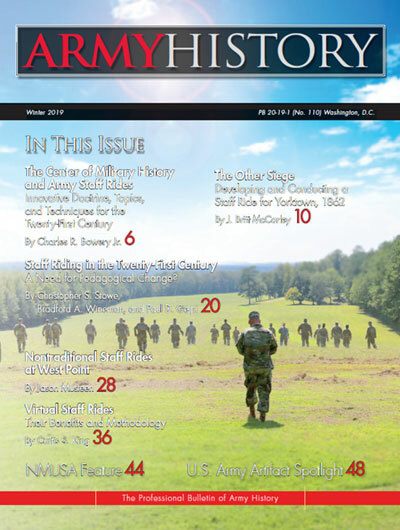 This Winter 2019 edition of Army History is a little different from our usual fare. Thirty years ago, this publication, then known as The Army Historian, published an issue (Fall 1988, no. 12) comprised almost completely of articles concerning staff rides. The cover article was authored by then-Army Chief of Staff General Carl E. Vuono—signifying the staff ride’s importance as a component in the Army’s military education programs. Much more than a simple battlefield tour, these in-depth examinations of historical military engagements have been one of the Army’s primary leadership and professional development tools for over a hundred years. Three decades later, we have decided it was time for an- other focused issue to examine what has changed in how staff rides are conducted and presented. We are pleased to offer contributions from a wide range of sources such as the U.S. Army Center of Military History (CMH), the Army Command and General Staff College, the U.S. Military Academy at West Point, the Army Training and Doctrine Command, and the Command and Staff College of the Marine Corps University. We hope that these articles will not only help solidify the historical staff ride’s place in twenty-first century military education, but will also introduce readers to some of what’s changed in the last thirty years and how new technologies can improve this tried-and-tested means of professional development. This issue also presents a construction update on an interesting component of the National Museum of the U.S. Army, a sneak preview of a upcoming publication about the Army’s collection of World War I artifacts, and, as always, an interesting crop of book reviews covering topics like Civil War battle- field guides, the Joint Chiefs of Staff, and the war in Iraq. Finally, our chief historian provides an update on the initiation of contracts for historians who will author some of the volumes in CMH’s forthcoming series on Operations ENDURINGFREEDOMand IRAQI FREEDOM. On a personal note, this is my thirtieth issue as managing editor of Army History. I wanted to take this opportunity to say what an honor and privilege it has been to shepherd this publication through the last eight years. I look forward to many more years of presenting quality issues with thought-provoking content. As always, I invite your constructive comments and submissions and submissions at usarmy.mcnair.cmh.mbx.army-history@mail.mil. By Charles R. Bowery Jr.
A Need for Pedagogical Change?